I attended the Woodstock Guitar Show on the weekend of October 23-24. I’d like to tell you a bit about it. It didn’t strictly speaking take place in Woodstock; it took place in Bearsville, which is close by. Apropos of nothing, the Woodstock area is in the Catskills, a famous resort and retreat area, that has traditionally offered lots of fishing, food, whitewater, and entertainment. The Catskills, I’m told by someone who lived near there for many years are not, technically, mountains (and indeed, the Woodstock area is not at all mountainous). The Catskills are actually a “dissected peneplain.” The real mountains (the Adirondacks) are a couple of hours north. Again, wow. Anyway, I got there by taking my first-ever redeye flight: from eleven p.m. to eight a.m., across three time zones. An overrated experience, I must say. I cannot sleep on planes. Especially sitting upright in a padded, seat-shaped sardine can. Guitar-wise, the Woodstock guitar show is in the stomping grounds, and the descendant of, the famous-but-no-longer-happening New York Guitar Show — for a time the most prominent American handmade guitar show. It was heavily weighted toward archtop and jazz guitars, as New York and its surrounds is the epicenter of jazz’s musico-geographical territory and home to legendary archtop guitar makers such as John D’Angelico, Jimmy D’Aquisto, John Monteleone, Ken Parker, and many other talented-to-legendary makers and jazz players. For archtop makers and players, Woodstock is very near Mecca. Unfortunately, of course, I make flat-tops. But no one minded that. [My former apprentice] Michihiro Matsuda and I got invited to Woodstock. I think, because our names — like so many of the legendary archtop makers — end in vowels too. I think there’s some rule about that. (The vowel in Ken Parker’s last name is silent; or they make exceptions for the letter ‘r’.) Speaking of Ken Parker, spending time with him was one of the really high points of the festival for me. For those of you who don’t know him, do please look his website up; he’s creative beyond words — and whereas I kid a lot about many things I’m not at all kidding about Ken. He’s awesomely smart, capable and original — and a human being of impressive integrity. One thing that I couldn’t help noticing about the Woodstock festival was how many collectors I met who had REALLY IMPRESSIVE COLLECTIONS of archtop guitars made by several of the most legendary makers. Usually, I meet people who have three or five or ten guitars, most of which are pretty ordinary; these collections SPARKLED. But then again this geographic region is home to a lot of people who can afford the best several times over… and they go for it. Interestingly, one reason for the preponderance of interest in archtop guitars in this region is the climate: the marked Summer heat and humidity alternates with the severely dry Winters. Archtop guitars can survive such weather whereas flat-tops will often crack, warp, and be subject to other problems of wood movement. The reason for this is that wood expands and contracts with changes in the weather, and of course guitar tops and backs are also more fragile and delicate than furniture is. Archtop guitars allow such ‘accordioning’ freely because they lack across-the-grain bracing. The flat-top guitar does have that. While this is good for tone in the flat-top guitar it simultaneously prevents wood movement, as the woods fibers are ‘locked’ into one configuration that allows very little movement. Therefore, if the wood wants to shrink but is prevented from doing so by the bracing, it will instead crack from the resultant pent-up tensions. As most luthiers know, making any flat-top guitar destined to live out its life on the East coast requires attention to the conditions under which the soundbox is assembled: a humidity-controlled room is a must. I mentioned this to a friend and he is of the opinion that the sovereignty of the archtop in that area is not a function of weather but of culture. He said, quote: The NY tradition of jazz guitars going back to D’Angelico remains strong but I don’t think it’s related to weather as much as to NY’ers insularity — for one of the world’s great cosmopolitan cities, NY breeds a strong sense of local superiority. It’s the one place I know where “not a prophet in one’s own village” doesn’t apply. To a real NY’er, if you’re not from one of the five boroughs, you’re a yokel — and if you’re from Staten Island, you’re not really a NY’er either — and only things from NY are good enough for a real NY’er. So if people in Manhattan are making archtops, well, there you are: they’re the best no matter what people are doing anywhere else. End quote. The truth is in there somewhere, I’m sure. But okay, enough technical talk. My apprentice Jason Kostal came with me to help at my table, which was a big help to me. He also came with his partner Catherine, whom he took a few days off with to show her the area. Jason graduated from West Point Military Academy, which is not far from there; they visited his old Alma Mater and saw a few of his friends who are still in the area. From what I’ve heard West Point’s discipline and work load are legendarily fearsome: only about a third of any entering class graduates. It says a lot for Jason’s stick-to-it-ness that he made it through. The Woodstock show itself is the brainchild of Baker Rorick, a local fellow who knows a lot of the wider guitar community. Several years ago he thought that a small showcase event for his friend Ken Parker’s work might be simpatico and fun; they started inviting a few fellow luthiers in and it grew into what has the potential to become a really special national-level show. Baker will of course now have to deal with whether to keep it small or allow it to expand — and deal with the accompanying organizational logistics. I don’t know how much money he made off this event, but he seems to have earned it: he was everywhere, all the time, running errands and problem-solving and pressing the flesh and everything else in between. I gotta say he looked tired. As a rule, first- and second- and perhaps even third-time events don’t make money; they’re too new and the costs are high. But if the show gets a good reputation and grows, then some money starts to roll in. I have been working on unusually heavily inlaid guitars of late; I made a rosewood Andamento guitar a year ago and just finished a second one in maple, which I showed at Woodstock. Working ornamentally in maple is an act of madness. The thing is, a dark wood such as rosewood is forgiving: you can make a mis-cut and no one will ever see it. You can’t get away with that in maple: any glitch or miscut will be visible. So, this project took infinite care and patience. I’m indebted to my apprentice Chris Morimoto for having the patience to take much of this work on; that guitar really shone! That guitar was quite well received and got tons of compliments. But as a matter of fact, I was surprised to be told by a good handful of people that they’d only come to the show because they’d heard that I was going to be there, and they wanted to meet me. I’m flattered that they would make the effort of driving several hours each way, to talk with me. I guess my reputation as a maker of things really worth seeing has gotten out there. Next, I’m gonna work on my reputation as someone whose work you really have to buy to be considered cool. Michi Matsuda, by the way, also makes highly lookable-at guitars that are brilliantly designed. He was two tables away from me and attracted more of a crowd than most people and he made a sale to Steve Earle, the very prominent Nashville guitarist. Go Michi! Lodgings in the Woodstock area require a rental car; there are lots of little communities in the surround, each a few miles from one another, and each with its Bed-and-Breakfast or small hotel. But there’s no big central area such as you’d find in any city. Ken Parker got me put up at a friend’s house, and I have to say that meeting Perry Beekman turned out to be another high point for me. Like so many people who attended the show, Perry has been in the music biz for years and is impressively knowledgeable about people whom I’ve read about for years but never before met. And I’ve got to say that Perry is one of the wittiest people I’ve met, and a pretty hot jazz guitar player. I’d like to meet him again. Perry hosted a Sunday evening dinner at his house for some of the attending luminaries; we were all in exalted company! I should add that some of our group are home vintners; we did some pretty good male bonding over some of their bottled hobbies. I usually simply fly back home after one of these shows but this time I took an extra day off. I’d been contacted by Bob Visintainer, an audio-visual media guy who’d found out about me and my work a few months back, and liked what he found. He wondered whether he had any contacts that would be useful for me, to enhance my professional presence on the East coast — and volunteered to help me. So I spent Monday with him in Manhattan, being introduced to some of his professional network in the world of art and furniture galleries. I must say there’s some really impressive and expensive stuff in these places. I don’t know yet what can come of these introductions; they are like planted seeds. But it was a pretty amazing day. Bob makes a living by selling outrageously expensive high-quality audio-video equipment for home entertainment centers and security systems. He is the dealer for Goldmund (Swiss) speakers that have extremely high fidelity and output: the top-of-the-line system weighs 1200 pounds and is rock-solid STABLE; it’s installed in a sensurround way, all around a room. I mean, it practically takes a home remodel to install these… the speakers go into and behind walls and screens so no one sees them… and they are soooo impressive when you hear them. Bob sells to clients like Jerry Seinfeld, who is a non-guitar player I’ve actually heard of. Interestingly, Bob had a significant life-changing (and very near-death) experience about a year and a half ago; it caused him to slow down and spend some time enjoying some of the flowers growing at the sides of the road through life, which he told me he’d been zipping down at a respectable Type-A speed. So now he involves himself in things that are interesting, enjoyable, broadening, and ‘feel right’. I have to say, the world would be better if more people made those kinds of things a priority. I got home about one o’clock on Tuesday morning. At 1:30 that afternoon I was at the Santa Rosa (about 75 miles North of me) courthouse to read a Victim Impact Statement at the sentencing event for Taku Sakashta’s murderer. Taku was a very much loved member of our Northern California lutherie community, who was killed last April by a drugged-out paychopath. The guy had been caught, a lot of forensic evidence was collected, he was judged and found guilty of murder, robbery, burglary, evading police officers, and something else. I was a close friend to Taku and Kazuko, his widow, had asked me to be part of this. Without going into detail, I might say that it wasn’t like they show it on television. The event was hushed and ponderous and full of legalese. Everything moved slowly and inexorably forward, like the sound of a grandfather clock in the hallway at night. The culprit — who was wheeled into the courtroom shackled to a wheelchair (he’d exploded in rage when the jury announced its verdict three weeks before, and had to be restrained by the courtroom police) — was sentenced to life in prison without the possibility of parole, plus eight years (there are convoluted legal formulas for adding ‘enhancements’ to sentences, for reasons of special circumstances). I’ll miss Taku: he was very special; and he certainly didn’t deserve to be killed with the brutality that he was subject to in the last moments of his life. I have to say that Taku was a sort of genius in lutherie, and he said more than once that he expected to die young; I don’t know how he came up with that piece of wisdom. My partner Karen and I had a Japanese maple tree planted in front of my house that we will call Taku’s tree. Otherwise, it was horrible; a real lose-lose. Kazuko lost a husband, we lost a friend and colleague, the perpetrator’s mother lost a son… the murderer is 28 years old and basically has thrown away his life; no one outside of the prosecutor’s office didn’t lose something from this. I got home from Woodstock to find my emailbox chock full of new mail, and my shop basement a little bit flooded. Email-wise, who knew I could be so popular, or how many people know that I need viagra? I’ve spent several days answering emails, and I’m pretty much done with the flood. Now I’m almost done with this letter, too. The basement is being taken care of tomorrow. Apropos of nothing, while I was out of town Karen saw a play that was extraordinary and that she’s recommending to anyone and everyone. It’s playing in Berkeley now, but for anyone in NY who likes theater, “The Great Game: Afghanistan” will be there, at the Public Theater, in December. It’s a British production (Tricycle Theatre). Karen chose to do it as a one day marathon, but that’s not mandatory. It’s many mini-plays clumped into three performances. The first performance starts with British imperialism, the second performance involves the USSR and the US arming Pakistan, etc and the third performance is very recent history. Well, that makes it sound like a history lesson, but it is great theater. Lots of different points of view. Brilliant acting. it’s what the market can bear. Any or all of these things may well be ‘true’, but we’ve all heard them so often that I don’t think I need to go over any of this again. However, I do think this is the wrong question to be fascinated by. I mean: do you really care why something costs a lot, other than academically? A much better question is: what is the reason you would/should buy anything significantly expensive? Let me explain my thinking. Let’s first look at the proposition that something is ‘of higher quality’ than something else. This can sound plausible. However, quality means quite different things to different people. For the buyer, it is greater functionality, durability, and satisfactoriness. For the manufacturer it generally means problem-free production, consistency of product (minimal number of rejects/seconds), and a good bottom line. For the seller it means sellable, and no complaints or returns. While the fine print to these points, if I may put it like that, is never mentioned out loud it is essential to understanding the Dance Of The Purchase-And-Sale. This fine print is: (1) The salesman is undoubtedly a nice person, but isn’t really interested in your happiness; he needs to make the sale; the friendlier he can do this the better. (2) The manufacturer, very likely your average guy who is trying to make a living, doesn’t care about your personal happiness nor the salesman’s; he needs to make and ship his product out and keep his own people happy. (3) You, likewise, are a good person but don’t really care how many problems the manufacturer or salesman have: you want to get a good deal and be happy. This isn’t cynicism, by the way; it’s just that when money is involved you are operating exactly within this territory — along with these other people who happen to be on temporarily intersecting paths. Moreover, everybody concerned (including you) has their own [and rarely mentioned] overhead, however it may be calculated. Aside from quality, however it may be defined, there are three main factors that affect the price of anything. They are pretty common-sensical and shouldn’t mystify anyone. The first of these is: the market has its own rules for setting prices. These rules have nothing to do with you other than statistically. Furthermore, nothing exists at only one level of price and quality. You can buy a toaster for $29.95 or $229.95, or a car for $10,000 or $300,000; monkeys, bananas, and everything else in between all follow this general rule. Guitars won’t be any different. The second factor has to do with Supply and Demand, although this is disguised as quality and spoken about in terms of rarity, stylishness/workmanship of design, uniqueness, the time, effort, and skill involved, and, not least, marketing and cost of doing business. But these still come under the heading of “supply and demand”. The third factor is the most interesting because it is entirely irrational: it has to do with whether something speaks to one or has personal appeal — as though we were talking about matters of Art or Religion. It doesn’t matter whether this is based in personal greed, passion, obsession, spirituality, taste, altruism, competitiveness, lust, fantasy, reality, or ego. The brain’s Pleasure Center gets a definite jolt from some purchases. This is not good, bad, smart, stupid, or greedy: it’s simply how things work. And as long as one has the money it takes, the thornier aspects of decoding the quality of something may be happily ignored. Don’t get me wrong: there really is such as thing as Essential Quality; it’s just that you’re not going to hear about it from anyone who has a vested interest in selling you something; you have to talk with an informed and neutral party to get to that. The most powerful single component of this irrational factor is that things produced or associated with well-known people or entities command higher prices. This is an immutable law. Note that I’m not saying this is bad; it is merely not rational. Any famous artist’s work commands higher prices, regardless of how weird his art is. The value of such things resides in a tangle of true worth or merit, ‘brand loyalty’, current popular opinion or faddism, “owning a piece of… “, canny-to-unscrupulous marketing, nostalgia, being “ahead of its time” or “vintage”, or any of the feelings listed in the second sentence of the preceding paragraph. What do these things mean, for us? I think they mean two things. For starters, it means that we should consider admitting that it is the least rational part of buying something that makes the experience the most thrilling. Second, it means that the more expensive the thing is that the buyer is in the market for the more The Iron Rule of Buying (known in the old days as the Caveat Emptor clause) needs to be obeyed. In buying horses you should be able to tell the difference between a race horse and a painted nag with a nice saddle; the same goes for guitars. For these reasons, most important rational corollary to the pricing/buying complex is that you need to have a sense of whether the claims that are made about an expensive object match its actual pluses and minuses. You must do some homework!!! If this means paying someone knowledgeable to give you some useful pointers, then you should consider doing it: otherwise you becomes the seller’s lawful prey (it’s his job, after all, to sell you something) and your thrill will have a short half-life. While this probably sounds a bit overdramatic it is really no different than looking both ways before crossing the street. There are only two reasons that I can think of for buying an expensive guitar. The first is that one will love it. The second is that it is looked on as an investment. These motives can be combined in any guitar purchase and, with both, it involves doing your homework and paying attention to your own motives, experience, and desires as well as evaluating the guitar on its own merits. Play it. Listen to it. Compare it. Check it out. Would you buy a house without a structural report on it? Most people have never had the opportunity to listen to a truly good guitar’s sound or to appreciate the fine points of its design. They consequently understand these things about as well as they understand the tax code. Fortunately, as I said, one can pay someone knowledgeable for a few hours’ tutorial; it is well worth the cost. And, I repeat, you owe it to yourself: it’s your job to equip yourself to tell the difference between hype and the real thing. This is no easy thing to do in an environment where we’re all neck-deep in perpetual hype. But the fact remains that if you’re looking for something better than average, and if you can’t tell the difference between something genuinely good and something glitzed up but mediocre, then you have no business thinking about buying an expensive guitar. And simply reading other people’s opinions as posted on internet discussion forums isn’t likely to help much, I’m afraid. On the other hand, if you get taken for a ride, guitar-wise, it isn’t the end of the world: you can learn something from it. Finally, people are motivated to buy things partly because they feel time pressure; they believe they must act quickly or lose the sale. My wisdom on this matter is that there are mighty few true once-in-a-lifetime opportunities; it’s simply the market’s job to make you think this sale is one of them. Also, some perspective helps: the guitar you are agonizing about is just a guitar; it’s not a kidney. Ultimately, in buying an expensive guitar, you are not dealing with a simple case of ‘like’ or a ‘not like’. It’s an analysis for which any checklist of specific items or qualities is merely a set of guidelines. You’re actually playing and listening and looking for the overall quality of the experience. Everything should be of top quality: at a top level it has to be so. You’re looking at: ‘is every element technically correct’? And then you’re looking at the creativity, and the little touches. Does it work as a whole? Does the balance of the various elements work? Is the sound rich, full, and expressive? Does any part of the sound fail to compare with any other part? Does the response under any particular left-hand playing position overpower that of any other position? Do different right-hand positions produce full and interesting tones? Does anything in the visual field dominate everything else? Do the curves of the upper bout ‘match’ the curve of the waist and the curves of the lower bout? Is the rosette the right size for that guitar, or is it too emphatic, or underprominent? Do the colors of the various parts and woods match and complement one another? Does the guitar seem put together by one artist, or assembled by a committee? If any one thing grabs your attention more than any other element and doesn’t let go, does that not somehow denote a lack of balance on some level? Any lack of balance denotes some degree deficit, and a five star guitar (to borrow a ranking system from the restaurant business) should be of the highest quality and be ‘right’ in everything. Including the quality of the thrill. Everyone in the guitar making and selling business makes their guitars as shiny and beautifully attractive as they can. They also cite their guitars’ sound as a selling point. And they invariably tell you or imply that their wares have good quality. Why would they not? A further selling point might also be that you should buy a particular guitar because some prominent person out there has one just like it. Is this quality? Not at all: it’s simply how the world works. I’ll return to the subject of sound further on. One can quibble endlessly about what is and what is not Quality. I pointed out in a previous essay that quality means quite different things to different people. For the buyer, it is greater functionality, durability, craftsmanship, and satisfactoriness. For the manufacturer it generally means problem-free production, consistency of product (minimal number of rejects/seconds), and a good bottom line. For the seller it means sellable, and no complaints or returns. Let’s look at this from your perspective. For you as a buyer Craftsmanship/ Workmanship will have to do with anything that is done purposefully and with skill. Therefore, you might want to find out what you’re really paying for in terms of who had done what work. 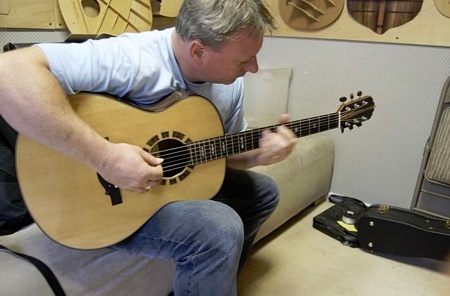 It is increasingly common for luthiers to get their guitar necks, bridges, and other parts made by a CNC service. So the question for you becomes: am I paying for your luthier’s craftsmanship, or for his assembling parts that he subcontracted with someone else with high-tech equipment to make? Don’t get me wrong, technology embodies a lot of skill and craftsmanship: someone had to create the machinery and the computer software that will do a complex task at the touch of a button. But technology, by itself, offers no craftsmanship of its own: it is aimed at well-greased rote procedures. And you should know whether you’re being expected to pay for actual craftsmanship or someone else’s prior (and expensive) craftsmanship that is embodied in a (bought or leased) push-button format. Amazingly, this makes no difference to some people. Still, as long as we are focused on craftsmanship, there are things that one should expect to see, hear, and find on an expensive new guitar (vintage guitars are subject to different standards) that won’t be features of cheaper instruments. My own list would include the following. They are all features that my guitars have, and each one of them takes extra time, attention and effort to do. ** Impeccably clean workmanship. ‘Workmanship’ here implies hand work, not machine work. That means smooth, ripple-free surfaces that bespeak of good wood preparation, a lack of visible file or sandpaper marks, and crisp joints, seams, and edges. The finish should be mirror-smooth and free of the tiny scratches that buffing wheels leave. If you’re considering buying a guitar I’d recommend that you spend a good ten or fifteen minutes carefully looking it over to get a sense of the workmanship in it; use a magnifying glass if necessary. ** All-wood construction and appointments such as bindings and purflings. This comes automatically on classic guitars, but steel string guitars very often have plastic bindings and tuner buttons, etc., because the market has long since accepted these. Wood is better. Solid wood is best for soundbox construction; plywoods are characteristic of cheaply made instruments. ** Mitered [like picture-frame corners] purfling joints. Every angled juncture of line elements should be a mitered joint, not a butted one. ** If tone is your focus, then straight-grained body woods are more desirable (and also more scarce) than highly figured and wavy ones. The straighter the grain the more stable and predictable are the vibrational properties of the soundbox. ** The body woods on expensive acoustic guitars are traditionally rosewoods. The most expensive of these are straight-grain Brazilian; the second choice is East Indian. Other woods on expensive guitars can be alternative rosewoods, figured maple, figured koa, and figured mahogany. Topwoods are typically spruce, or sometimes cedar. In my opinion European spruce and Sitka spruce have equivalent tonal potential, in spite of the fact that most people have been taught to believe that the former is better than the latter. Being an import, it’s merely more expensive. ** A certain amount of customizing (without altering the identity of a guitar) is a real plus; it is not unreasonable to expect some original inlay work such as beautiful shop-made rosettes. Some guitars are so ornamented that they stop being guitars and have become artwork that uses guitar-shaped wood as a canvas. Such guitars really belong in art galleries, not music stores. ** Delicate elements such as small-profile heels. A guitar’s typical neck-heel curve is a 4″ diameter one, achieved by the front roller of a belt sander. Smaller heel curves require more work and are ergonomic: they let the left hand get closer to the high frets. ** Ergonomically offset strings: there should be more clearance between the first string and the edge of the fretboard (so that the string doesn’t pull off during play) than between the sixth string and its edge of the fretboard. ** Evenly spaced strings. You’d be surprised at how many guitars are sloppy on this feature. ** If at all possible, custom-shaped necks contoured and matched to the individual’s hand and style of playing. But this is more likely when commissioning a new guitar instead of buying an already-made one. ** If the guitar is a cutaway model, the cutaway should blend seamlessly into the neck and heel, without the ‘corners’ that many guitars offer. In fact, seamlessness of construction is always a clue that something is better made. ** Heelcaps are best if they are an extension of the surface of the back, rather than being a stepped point of discontinuity. This goes to the fact that, historically, the most expensive and prized guitars have been made using the Spanish method, in which the necks are firmly part of the guitar body. This allowed the heel and the back to become one uninterrupted surface. Lately, and especially in steel string guitars, bolt-on necks have been making inroads into high-priced guitar territory; heels and guitar backs do not meet in such cases. Traditionalists think this manner of building guitars is of second-best level construction. ** Intelligent voicing. Most buyers won’t know what to look for, but the guitar’s responsiveness will be the proof of this factor. If the guitar’s sound surprises and pleases you, you’ll have one of these in your hands. Your pleasure will be the fruit of years of experience on the maker’s part. ** Extensive hand work at every stage and level of the instrument. Production facilities make money in direct proportion to how much time they can save at each step. One should expect to see handmade rosettes rather than commercially bought ones, on fine guitars; and also tasteful additional touches such as wrap-around fingerboard bindings and heelcap inlays. If aesthetics are something unfamiliar to you, consider taking an art appreciation class in night school. Or pay someone who knows what’s what for a few hours of their time. ** Thin finishes. These are more work-intensive to apply and buff out, but make a louder and more responsive guitar than would be possible with ‘standard’ finishes. The difference in tap tone between a naked guitar top or back, and one that is covered (and damped) by a standard finish, is shockingly obvious the first time it is heard. ** Instrument playability should be remarkably easy. This will have to do with the and correct set and relief of the neck and an optimal height of the strings above the frets. Steel string guitars should have about 2/32″ clearance between the twelfth fret and the first string, and 3.5/32″ clearance between the twelfth fret and the sixth string. For classic guitars these numbers can be increased by 1/32″. When these things are done correctly the guitars play cleanly, with no string buzzes. ** On the bridge, the saddle should hold the strings at about 1/2″ above the guitar’s face, in steel string guitars as well as classic ones. In either case, the saddle should protrude above the bridge itself by at least 1/16″ and not more than 1/8″. ** Most guitars, especially steel string instruments, don’t play perfectly in tune. You should expect an expensive guitar to not have this problem, either from string to string across the fretboard, nor up and down the fretboard at any and all positions. Intonation-compensated saddles are necessary to ensuring that the guitar plays in tune. When considering a particular guitar, it will pay you to sit down with it in a quiet room and actually, carefully, listen to it. ** The guitar’s center-of-balance is a positive design feature. If the guitar is going to be played in a sitting position, its mass needs to be well distributed on either side of the waist so the guitar sits on the player’s lap without effort. ** Superior design: all the guitar’s lines, proportions, and curves, will all be deliberately considered and matched to its other lines, proportions, and curves. The aesthetic will be pleasing to look at and one won’t tire of it quickly. Simple though this sounds, anything that has a classic, timeless look is based in years of thought and experience. I’ll have more to say about this further below, in the section titled “The Right Look”. Also, taking an art appreciation class as I mentioned above can be a big help. ** Finally, hopefully, an expensive guitar should have a sound that’ll knock your socks off. People describe the best guitars with words such as piano-like, full, rich, clear, sweet, warm, powerful, transcendent, and evenly responsive. If your expensive guitars doesn’t sound all that good then you’ve paid a lot of money for furniture, a fancy planter box, or a costly birdhouse. As far as guitar sound goes, a basic thing is this: Nylon string guitars, by virtue of their design and stringing, naturally opt to be bass-heavy; they don’t naturally want to produce the brilliant, singing trebles that serious musicians are willing to pay the big bucks for. Contrarily, steel-string guitars are biased toward producing high-frequency signal: they want to sound bright at the expense of a full, rich, and present bass. In this regard, the guitar maker’s challenge in making these different soundboxes is exactly opposite. He needs to apply his skills toward eliciting a good treble from the Spanish guitar, and likewise toward coaxing a good bass response out of the steel string instrument. And, in both, the luthier strives to make instruments that have an even response on all strings and in all positions. These are no easy things to do. Better guitars have superior dynamic range. This means that a guitar can follow the player’s lead: it plays quietly when played softly, keeps up with the player as he attacks the strings with more and more vigor, and switches gears easily with his in-the-moment musical inspiration and touch. Therefore the guitar can not only speak with power, but also with flexibility and subtlety. Second and third-tier guitars have a narrow dynamic range and sound pretty much all the same no matter how they’re played: this will work fine for playing rhythm but it makes them less suitable to be musically expressive. Many players don’t yet know about this dimension of guitar sound and the first time they meet a guitar with a notably open and flexible voice it comes as a revelation. A better guitar should also, in my opinion, have a highly colored sound. That means that the soundbox emits a rich mix of fundamentals and overtones. Players describe such sound with words like rich, smoky, complex, or as having many voices — as though there were ‘a choir inside the guitar’. And the this sound is invariably a harmonious and blended one; no one element or component overshadows the other ones. Unfortunately many guitars, even pricey ones, sound somewhat shallow, colorless, or thin in comparison — although this may not make sense to anyone who hasn’t yet heard a guitar with a genuinely full voice. It will mean something to those of you who already enjoy orchestral music, or know things with fullness and complexity of taste or smell, or have experience of artwork that has richness of color and texture. Such tonal qualities are the fruit of a lifetime of hands-on work in the making and voicing of guitars. This has necessarily involved making lots of mistakes and blunders, but people who buy really good guitars get the benefit of all that. In fact, that history is literally embedded (although invisibly) in each guitar that leaves an experienced maker’s shop. Finally, while it is easy for me to throw words like brilliant, smoky, full, rich, deep, vibrant, and present at you, it will be worth your while to find someone who’s played an perhaps even recorded with a guitar with these qualities, or at least heard such guitars being played, and have a conversation with that person. Or, if you can, you should to a maker’s shop, or to any of the new boutique dealerships that cater to high-end guitars only, and play one. The more experienced ear you have, the better choices you will make. I think that really good guitars are complete packages in that, along with sound, playability, workmanship, etc., they also have something like ‘the right look’ — even though that probably sounds a bit weird. But to illustrate this, let me tell you about a personal experience. Some years ago I tried to introduce my artwork to a very high end gallery, imagining that they couldn’t possibly turn down something as original and unique as my stuff was. Uh… wrong! The owner, a very successful, smart, well-regarded, and highly positioned authority in his field, commented that my work looked ‘cheap and gimmicky’. I was floored and offended. I eventually understood that the man had not been trying to insult me. He had in fact been delivering a neutral but accurate assessment: within the canon of the work that he dealt in and sold, my stuff really didn’t measure up. As far as he was concerned, my work didn’t look like the things his clients would spend a lot of money on. Running a gallery, his standard was the artistic or aesthetic appearance as the main clue to the underlying artistic skill, sensibility, and integrity of design and structure. In truth, there is a ‘look’ to special things that are expensive that is different from the look of ordinary things. You have only to look in any upscale magazine that offers expensive merchandise to see examples. Things that have ‘the right look’ involve the totality of the package, including one’s response to it. The words ‘tasteful’ and ‘elegant’ come to mind. Furthermore, this is never accidental: it is done purposefully out of an artistic sensibility and level of design skill that have taken years to master, hone, and temper. It makes for a certain tastefulness, or richness, or effortlessness-of-looking-at-it (sort of like unexpectedly seeing a gorgeous sunset, or experiencing the thrill of a sudden insight about something fundamental). And this is worth something all by itself. As far as is known, we are the only species that can have such an experience. While ‘the right look’ can be obvious to anyone who has been introduced to such things, it can be problematically subtle for the inexperienced person. Ordinary things are, in a hundred different ways, visually off the mark: they are aesthetically out of balance in some way that the novice can easily miss at first glance. But I had been abruptly made aware of this distinction by being told that my work was, in effect, gaudy. Or, rather, the statement that my work was ‘gimmicky’ meant that I was trying too hard and without understanding the rules of harmony, balance, understatement, and good taste. I was, in the gallery owner’s opinion, in effect putting lipstick on a pig (NOTE: not that a lot of high priced stuff isn’t just that, but that’s not what we’re talking about here). The good news for you, as a customer or buyer, is that you don’t have to be able to create the ‘right look’; you merely have to be able to recognize it. And that’s not that hard to do; it certainly doesn’t need to take years of experience. Let me give you an example. Make a trip to some clothing outlets (from boutiques to Costco!) and look at the clothes they sell. The designer clothing looks a heck of a lot nicer than the regular stuff, doesn’t it? You recognize it immediately. And it invariably costs more. Well, the thing that attracts your eye to it is that it looks better (NOTE: some of it — especially in ‘high fashion’ — might not make any visual sense; but even it looks too exotic it will nonetheless look expensive). There’s something unmistakable about that and designers get paid a lot of money to make that happen. And the kicker is: it doesn’t matter if someone else doesn’t react to the thing the same way you do: all that matters is that you know that you do. The same principles apply to lutherie. If you simply look at some guitars — I mean simply get out of your own way and quietly pay some attention to them for a few minutes — you’ll find that some of them look quite lovely to your eyes while a lot of others don’t. You may be surprised, when you first notice this, at how you haven’t noticed it before: the difference is so obvious. I’m not talking glitz here: I’m talking loveliness, which is something that goes beyond glitz. If you pay further attention, you’ll discover reasons for your reactions. They’ll have to do with a sense of line, felicity of contour, color harmony, naturalness, balance, proportion, and authenticity. Guitars, in their own way, can fully look like Dior, Oshkosh B’Gosh, or Liberace. I don’t think that the gallery owner who turned my work down felt that he owed me any explanation for what he said to me. Neither did he feel any obligation to educate me to the standards and aesthetics that made his business (and it was a very successful one!) viable. But that’s what I’m trying to do now: educate you. Proper materials are important, of course, for every reason you can think of, and I’m not going to repeat all the marketing hype that invariably focuses on wood, quality, rarity, endangeredness, etc. etc. Overall, materials account for only a small part of the cost of an expensive hand-made guitar: the bulk of the price is in the skill and labor. In expensive factory made guitars, quite a lot of the price tends to be in the profit margin, as a lot of the labor will, quite frankly, have gone into figuring out how to minimize the labor and not improving the product. As I said above, the best defense against being taken for a ride is to become as educated as possible: you should be able to tell the difference between a race horse and a painted nag with a nice saddle. If this means paying someone knowledgeable to give you some useful pointers, then you should consider doing it.